SUBHEAD: In partnership with marines from Gabon the Sea Shepherd boarded and commandeered boat with illegal catch. 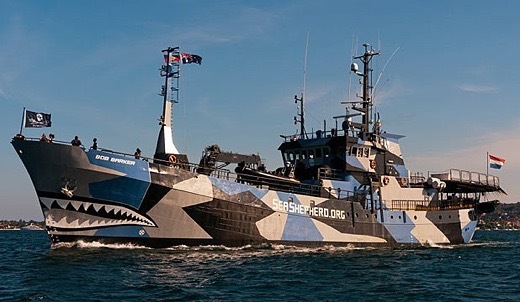 Image above: A 2006 photo of the Sea Shepherd ship "Bob Barker". From (http://teakdoor.com/world-news/115479-japan-wont-go-awhaling-year-cant-6.html). Although the long-liner was licensed to fish for 'tuna and similar species' inspections revealed that their fish holds were filled with sharks, predominately blue sharks that are classified as 'near-threatened' by the IUCN. Many of the shark's fins had already been detached from their bodies, a suspected violation of the European Union Finning Ban (1185/2003) and its amendment (605/2013), which requires sharks to be landed with their Fins Naturally Attached (FNA). Sea Shepherd Global was established in 1977, Sea Shepherd is an international non-profit, marine wildlife conservation organization. Our mission is to end the destruction of habitat and slaughter of wildlife in the world's oceans in order to conserve and protect ecosystems and species.